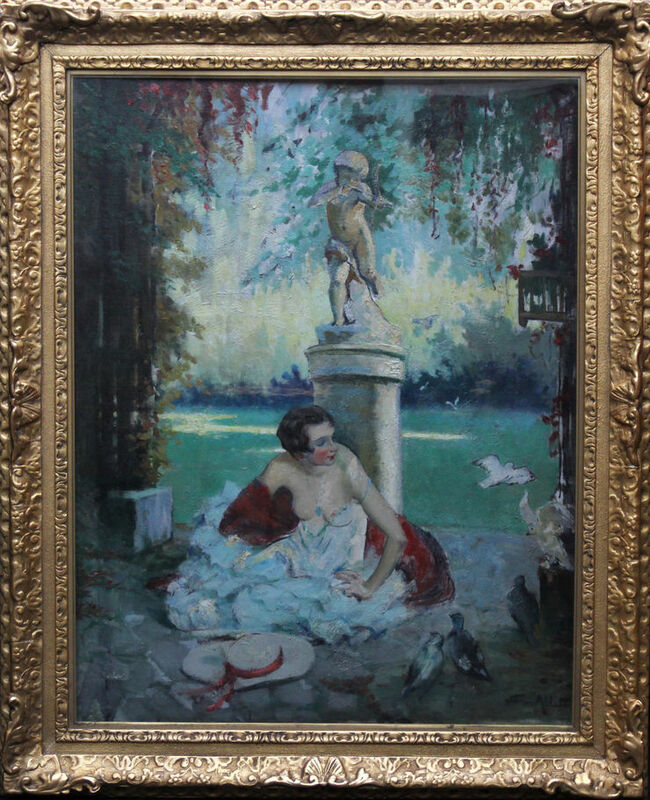 This charming French Art Deco romantic portrait oil painting is by noted French Impressionist artist William Albert Ablett. The painting was painted circa 1920 and has wonderful use of colour and heavy impasto. The composition is a beautiful semi clad young woman sat at the foot of a statue of cupid with his bow. 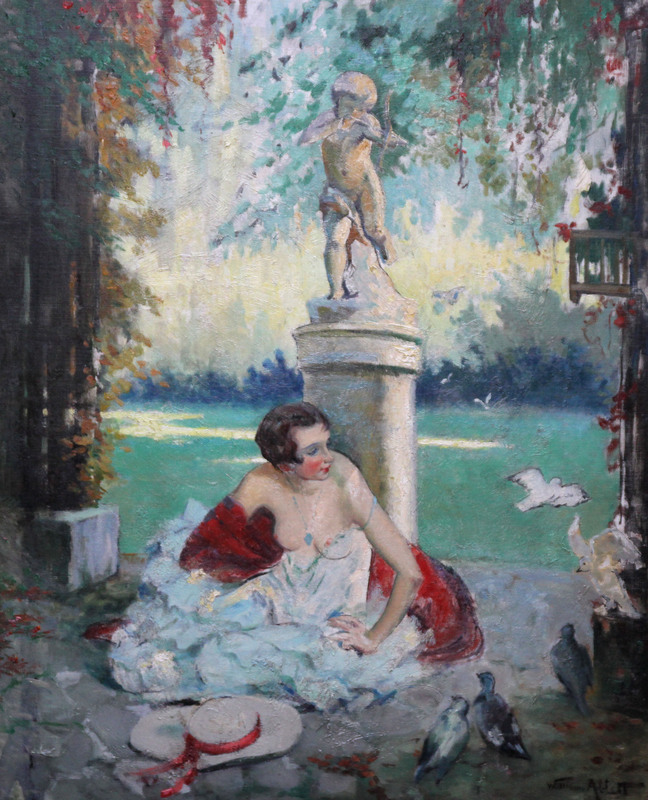 She is gazing at doves and there is an extensive garden in the background. It is a delightful French Impressionist romantic image. Signed lower right. Housed in a complementary frame, 47 inches by 38 inches and in good condition. William Ablett (1877-1936) was born in Paris of English parents. He was accepted at the prestigious Ecole des Beaux-Arts and began working in oils. Under the tutelage of his professors and mentors Aublet and Gerome, he quickly became very successful and was awarded a first prize. In addition to many portrait commissions, he won several awards in various Salons and Exhibitions, and was made a member of the London Royal Academy and a Chevalier de Legion d'Honneur. He took part in the Liege Exhibition of 1909 where he received a silver medal. A genre painter as well as a portraitist of numerous English personalities, he mainly exhibited in London from 1902 to 1904 ; as well as the Salon de Paris in 1906. He regularly continued to exhibit his works at the Paris National Society of Fine Arts from 1910 to 1936. He produced many portraits including one of Madame Alexander Dumas. His works are represented in the Museum of Blois and are included in the Wanamaker Collection in Philadelphia.